The repeater grew out of my interest in broadcast engineering. As you will see this was no ordinary repeater. It was most likely that my ego had run amok and was satisfied by doing a job well. Over the years it evolved from home-brew, military and two-way radio surplus to surplus radio and television station stuff. It grew from a single rack to more than three racks full and a transmitter that took up just as much floor space as well as taking over the top of the broadcast station's tower - with the owner's blessings. It did a lot more than just repeat audio and it was a lot more than just a receiver and transmitter connected together. The more it did the more I wanted to build. I could turn on a mic listen and to noises inside the building - and we certainly did hear some unexpected things. I could also mix in audio from the control link that allowed me to do silly things such as mix in the sound of a cricket underneath a particular station resulting in people commenting on the cricket that must be in their microphone only to be met with a reply of "What Cricket???!!!" Through the link we cold run multiple carted ID's that fit the season. There was a cart that ran repeater ID's in every possible language in which we could get them recorded. Kelly Layng of Channel 4 News fame was the "Repeater Lady" although she never knew it until after the fact and then asked, "What peter on a mountain???. She had been asked to record an I.D. for something that made no sense to her but graciously did it anyway. It could do a lot of things and do them well. 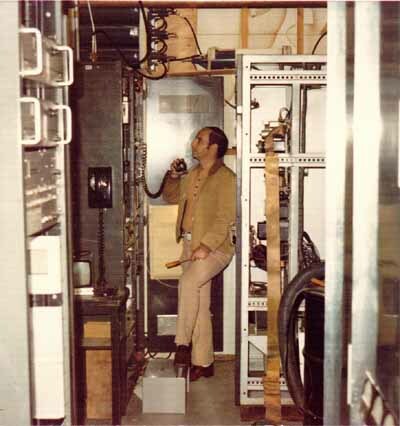 Two of the people who found a way to take advantage of the capabilities of the repeater were Jim "Woody" Wood and Bill Butler Sr. Along with the help of many Hams that worked with them so unselfishly they put together Operation Santa not only on the WA6TDD repeater but also the K6MYK repeater. Jim and Bill found a way to make the two repeater's separate and combined coverage and penetration do a good thing to bring a smile to a lot of kids that might otherwise have had a sad and lonely Christmas. I know that Art Gentry and I shared in the feeling that the intent was for us all to have a good time together and learn from each other at the same time. The repeater went to Mt. Wilson in early 1962. Although not involved in Amateur Radio, Bill Accord, KPFK's Chief Engineer was very supportive and instrumental in making it happen. Bill helped put together the agreement between K6OQK and Pacifica Radio that is in effect to this very day. Bill also helped me in applying for the Forestry Permit for the repeater. John "Skip" Benedickson, the local ranger in charge of Mt. Wilson was also very helpful in getting around governmental bureaucracy and was able to make things happen for us. Both are great people who went out of their way to help accomplish a good thing. 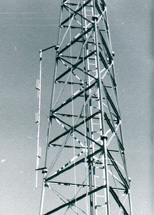 This is a picture of the original repeater. 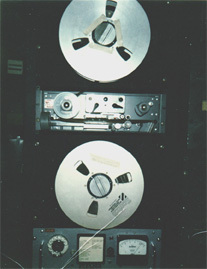 The equipment in the rack starting from the top: the greatly modified ARC-4; the 35 mm film loop MCW ID loop; a monitor speaker and amplifier; the repeater logic including a Veeder - Root "Beep" counter"; the audio mixer and early AGC audio processing; the remote control relay interface strip; the ARC-1 receiver and it's power supply. The ARC-4 was modified for higher fidelity using UTC wideband audio input and modulation transformers. The transmitter output was about 9 Watts. The 35 mm film loop ID had holes that were punched in the film using a standard single hole paper punch. The pickup was a piece of silver solder. The film rode between the silver solder and a grounded block of silver from an arc projector carbon clamp that was donated by a Ham/projectionist at a local drive-in theater. The logic for the repeater was a combination of relays, diodes and capacitors for the transmitter carrier control, delays and "Beeps". The audio chassis mixed the beep level, the MCW ID level, the local mic level and the receiver level. The AGC was pretty much a copy of Art Gentry's K6MYK repeater audio processor. The remote control used a D.C. pair from the phone company. A long D.C. pulse on the line would cause the repeater to come to come on the air. Short pulses after that would cause the audio to toggle or transfer to... well, nothing. There wasn't anything for it to transfer to but it would do it anyway - basically muting the audio. A reverse polarity D.C. pulse would cause the system to go off. The ARC-1 receiver was pretty broad. As I result I used the BC-348 receiver that's sitting on the shelf to the left as the second I.F. The BC-348 was tuned to the ARC-1's I.F. of somewhere around 9 MHz. The BC-348 also had a TNS (Twin Noise Squelch) combination noise limiter and squelch. The ARC-1 is sitting on it's side and you can see an adjustable shorting stub sticking out to the right past the edge of the rack. This was the only protection the receiver had from the transmitter other than the transmit and receive antenna's 100' of vertical separation. In spite of it's lacking anything closely resembling State of The Art for the time it worked quite well. The sign on the side of the rack had nothing to do with anything. I found it in the road one day and it just seemed like a good place to put it. The large EICO VTVM sitting on the shelf and a Heathkit Signal Tracer where the only two pieces of test equipment that I owned. I still have them. 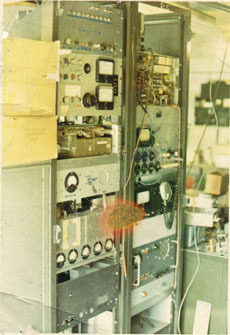 This is a picture of the WA6TDD repeater circa 1968. 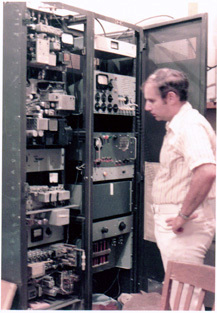 The two racks are RCA type BR-84s The equipment from top to bottom in the left rack is the original remote control telemetry generator; the ARC-4 10 Watt AM auxiliary transmitter (with the two large meters); a converted G.E. Pre-Progress 420 MHz 1 Watt telemetry link transmitter; the remote controlled modulation level adjustment; the 100 Watt AM transmitter with a 4CX250-B final modulated by a pair of 807's; the power supply for the 100 Watt transmitter. 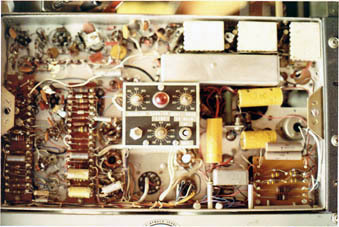 The right rack starting at the top contains the Two-Meter AM receiver that had the 8 KHz Collins Mechanical Filter; the mic pre-amp for the "inside the rack" microphone; the audio processing and logic chassis for the repeater; the wide-band 420 control link receiver; the remote control containing a 52 position stepper and the super-sonic tone decoders for the Step, Reset, Raise and Lower functions and a 24 Volt DC power supply. Most of this equipment is presently stored in racks in my garage. Someone wound up with the AM receiver when the stuff from Dave Farone, WA6KOS was auctioned off in the early 80's. 1. The inside of the AM receiver. This was pretty much a copy of Art, W6MEP's K6MYK AM receiver. It had a DC Amplified AVC system that drove the very low impedance AVC buss that got rid of a lot of the mobile flutter. Near the top left you can see the bottom of the 8 KHz Collins Mechanical Filter. 2. 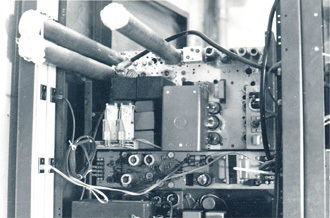 A rear view of the receiver showing the two re-entrant cavities and the cavity trap on the mixer grid. The two relays are for the squelch control motor located near the center bottom. The receiver was originally a Wilcox Electric Aircraft receiver that was stripped down to the bare chassis. The unit just below the receiver is the pre-amp for the "inside the rack" microphone. This is a picture of the WA6TDD/WR6ABE repeater and the 1 KW RCA BTF-1C Broadcast Transmitter that was on line for a while. The RCA is immediately to my back in this picture. 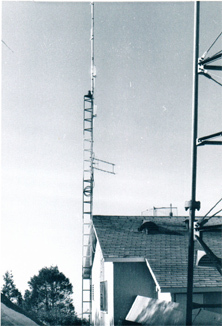 The RCA was feeding 1200 Watts up the 1-5/8 inch line to the single bay, center mounted Jampro Circularly Polarized antenna located about 8 feet above the top of the tower. The Jampro Antenna Company in Sacramento had built this antenna specifically for the repeater and it's center frequency was 146.40 MHz. The exciter that was driving the RCA's parallel 4-125-As 1st RF stage was a modified Marti RPT-40 RPU transmitter. The RCA's final was running a 5762 Triode in grounded-grid configuration. The repeater was constantly going through technical changes. 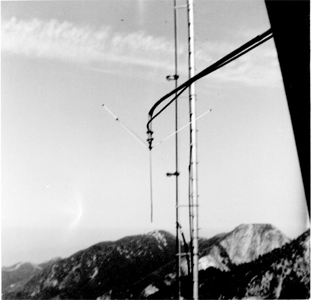 This picture was taken in 1975 by JA1FQO who made a special trip from Japan to see the repeater. 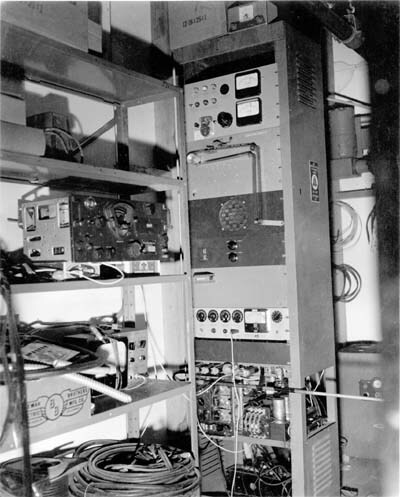 The equipment in the left rack from the top: The auxiliary transmitter, a Motorola 30-D that was modified for direct FM; The 140-D main transmitter also modified for direct FM and it's power supply; A panel containing a 5 KHz low-pass audio filter that pre-ceeded the transmitters; a G.E. Pre-Prog 420 receiver that was used as a link receiver from somewhere; the FM Sensicon-A main receiver and just above that is its metering panel; the Sensicon A's power supply and motorized remote squelch control.